This week's feature stood out to me at a recent Trashboat gig and stood out to be the net big thing in the world of pop punk. Admittedly I have heard of this band before, but I've missed them when they've played and I've never really gotten round to sitting and listening to them that was until the recent Trashboat tour which brought the Liverpool band over to Leeds. It was clear to see that I was late to the party because everyone in the crowd were up bouncing and singing away. They instantly reminded me of one of my favourite bands, Neck Deep (who they also supported back in April). They literally are everything pop punk. Bouncy, infectious and fun to be a part of. 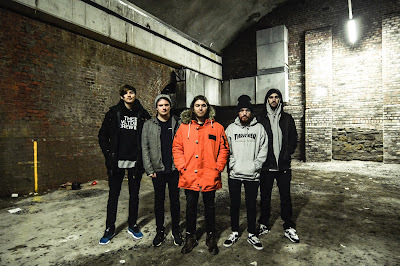 WSTR were actually signed to their record label based on one EP, good going ehh? I took my time to listen to SKRWD in full over the weekend and I absolutely love it! I genuinely don't think there's a track that I don't enjoy. A personal favourite being Fair Weather with an instant fun vibe from the off. Friendship is a massive thing to me and one set of lyrics stood out in particular being 'my friends are dicks, but I would never have it any other way'. Everyone has a friend(s) that are dicks, that can easily annoy you or just generally grate on you but regardless of that you wouldn't be without them, The sentimentality of this track really stood out to me. Another personal favourite which stood out to me was Ain't Great and this was very lyrically focused for me, The track itself is very much like Fair Weather, bouncy and fun yet the lyrics speak so much further with a past relationship. Yep, this part of the song spoke wonders to me. I've been on a rough ride but now I feel like I'm back to my old self and I feel like everything is going in the right direction. Overall, SKRWD really impressed me and their live shows impressed me even more but don't just take my word for it! Check them out yourselves - the potential for these guys to rocket in the music industry is real.